^ 1.0 1.1 1.2 1.3 1.4 Field, John M. The Textbook of Emergency Cardiovascular Care and CPR. Lippincott Williams & Wilkins. 2009: 11. ISBN 9780781788991. （原始内容存档于2017-09-05） （英语）. 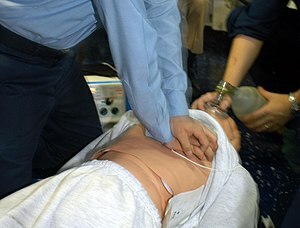 ^ 2.0 2.1 2.2 What Are the Signs and Symptoms of Sudden Cardiac Arrest?. NHLBI. June 22, 2016 [16 August 2016]. （原始内容存档于27 August 2016）. ^ 3.0 3.1 3.2 Who Is at Risk for Sudden Cardiac Arrest?. NHLBI. June 22, 2016 [16 August 2016]. （原始内容存档于23 August 2016）. ^ 4.0 4.1 4.2 4.3 4.4 What Causes Sudden Cardiac Arrest?. NHLBI. June 22, 2016 [16 August 2016]. （原始内容存档于28 July 2016）. ^ 5.0 5.1 5.2 How Can Death Due to Sudden Cardiac Arrest Be Prevented?. NHLBI. June 22, 2016 [16 August 2016]. （原始内容存档于27 August 2016）. ^ 6.0 6.1 How Is Sudden Cardiac Arrest Treated?. NHLBI. June 22, 2016 [16 August 2016]. （原始内容存档于27 August 2016）. ^ 7.0 7.1 7.2 7.3 Adams, James G. Emergency Medicine: Clinical Essentials (Expert Consult – Online). Elsevier Health Sciences. 2012: 1771. ISBN 1455733946. （原始内容存档于2017-09-05） （英语）. ^ 8.0 8.1 8.2 Kronick, SL; Kurz, MC; Lin, S; Edelson, DP; Berg, RA; Billi, JE; Cabanas, JG; Cone, DC; Diercks, DB; Foster, JJ; Meeks, RA; Travers, AH; Welsford, M. Part 4: Systems of Care and Continuous Quality Improvement: 2015 American Heart Association Guidelines Update for Cardiopulmonary Resuscitation and Emergency Cardiovascular Care.. Circulation. 3 November 2015, 132 (18 Suppl 2): S397–413. PMID 26472992. doi:10.1161/cir.0000000000000258. ^ 9.0 9.1 9.2 What Is Sudden Cardiac Arrest?. NHLBI. June 22, 2016 [16 August 2016]. （原始内容存档于28 July 2016）. ^ Schenone, AL; Cohen, A; Patarroyo, G; Harper, L; Wang, X; Shishehbor, MH; Menon, V; Duggal, A. Therapeutic hypothermia after cardiac arrest: a systematic review/meta-analysis exploring the impact of expanded criteria and targeted temperature.. Resuscitation. 10 August 2016, 108: 102–110. PMID 27521472. doi:10.1016/j.resuscitation.2016.07.238.